Giving effective feedback on students’ writing work is as important as the writing activity itself. Apart from guiding and motivating the students in the writing process, teachers usually have to respond and correct their learners’ compositions and writing assignments and return them later. The dilemma is that most of the students throw returned writing tasks away and rarely focus on the teachers’ comments or corrections. Many students don’t bother to read through their writing again. However, we can turn this feedback stage into a student-centered learning experience by involving students in correcting and reformulating their own compositions. When responding to students’ writing work, teachers could focus on one or all three categories: language, content, and form. Grammar and lexis relate to language; task completion and organization relate to content; whereas, layout and punctuation relate to form. Students need to know which area the teacher is focusing on to give it a special emphasis when writing. A successful composition comprises good language, smooth transition from one idea to another, and features of the target layout and correct use of punctuation. What to correct or highlight? It is a good idea for teachers to be selective when correcting their students’ mistakes. That depends on the students’ level and previously taught language area and semantic lexis. For example, if the students have written about their last holiday, teachers could logically focus on past tense verbs and vocabulary used in the topic of holiday. It is best if teachers discuss what to focus on with the students beforehand. Other times, the teacher might ask the students to focus on the organization of the ideas and punctuation, for instance. In order not to demotivate students, teachers should also praise the good language and ideas students have produced in writing, and there is no need to correct mistakes beyond their level. For instance, a teacher could write or say “I like the bit about your being able to read at an early age, but I don't understand what you mean by with my family”. Or “I love your story and the superb use of comparative adjectives. However, you still need to watch out for verb tenses a bit more”. I mentioned in a previous post about teaching writing that students can respond to and give feedback on their classmates’ compositions as a way of peer-editing and support. But if the teacher gives feedback, she can do it in different ways. The teacher could simply cross out the mistakes and write the correct versions above them. But this technique proves to be teacher-centered and not involving students in any cognitive work. A better way to provide feedback and involve students is to use correction symbols. To make their lives easier when they get the feedback, students should get a copy of the correction symbols with some training on how to use them. The teacher writes the correction codes above the mistakes and asks students to identify mistakes and correct them themselves. 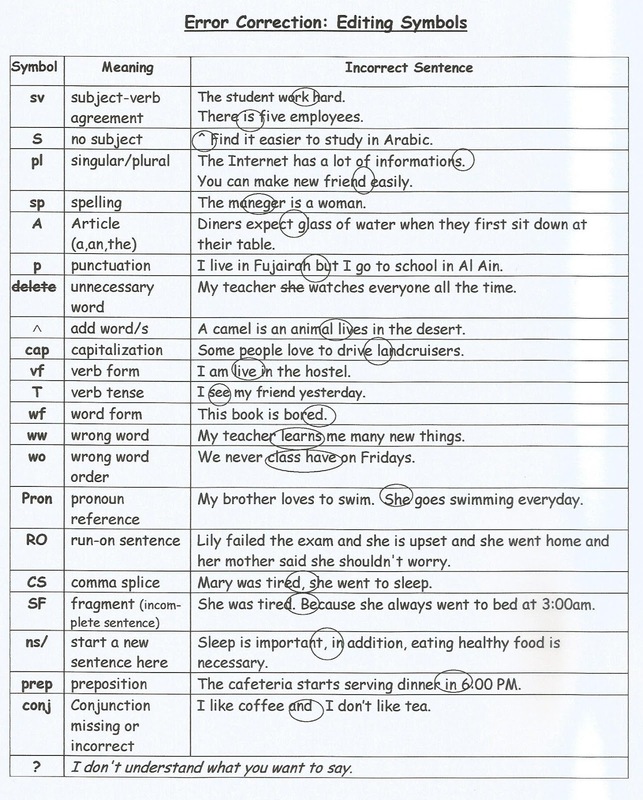 This technique urges students to think about the mistakes they have made and try to correct them by referring to a grammar or vocabulary section in their coursebook, for instance. Once students are familiar with this technique, the teacher can make the feedback more challenging by only underlining the mistakes without referring to the type of mistakes or write the number of mistakes at the end of each line. It is the students’ responsibility to identify or find the mistakes and correct them before they hand in the final draft. As I mentioned above, task completion and organization are features of content. I’m inclined to believe that task completion is the most important part/component of a successful piece of writing. Imagine that a student has written a composition using complex structures with sophisticated language but she failed to understand the task. In this case, she would lose most of the points awarded for the task. Teachers should stress the importance of reading and understanding the task first and foremost. Next comes the organization of ideas. Some students tend to write lists of sentences with no connection or apparent coherence. Students need to focus on examples and details that support each sub-idea and connect them logically with one another. Elaborating on ideas and writing adequate details improves the content of the writing. With regard to feedback on content, an effective approach is to write overall comments at the bottom of the paper or at the margins and discuss the feedback with each student face to face if possible. Form accounts for layout and punctuation. Layout is dealt with by referring students to the models and examples of the genre they are writing within. If they are writing an informal email to a friend and deviate from the layout, you get them to look at an email they have in their coursebook, or show them one to correct any shortcomings with the layout. Write some general comments, eg: be careful with the opening and ending of an informal email. Check the one we studied the lesson before. Or remember to start the email with Dear X,. Dealing with punctuation mistakes can be added to the language category above. A correction symbol (p) that indicates punctuation error is enough for students to consider and check the correct use of punctuation. Writing isn’t the most interesting language skill that teachers usually like to teach in class, nor do student enjoy learning it. There are several reasons for this assumption: students might not be accustomed to writing in their first language (L1), not familiar with the conventions of writing with a particular genre (e.g., formal letter, business report, etc. ), and/or usually left alone to conduct the task. Above all, most teachers focus on the writing product, not on the writing process. In other words, most teachers are concerned with what students write, not how they write. The following basic lesson framework helps you motivate students to write. Expose your students to different texts in the same genre. If students are learning how to write a thank you letter, they need to read more than one example. Analyze the texts and ask students questions about the style, register, grammar, and vocabulary. Draw their attention to the conventions and features of writing a thank you letter; for example, how to start the letter, where to add the address, and how to close it. Give a purpose to the writing task; tell students that they might need to write something similar in a form of a letter or email in the future. Therefore, they need to practice writing a thank you letter similar to the ones they have read and worked on. Give a time limit and allow them to consult their dictionaries but only for a few words. Encourage them to spread their linguistic wings and try to use recently-learned items to integrate grammar and vocabulary learning with writing. 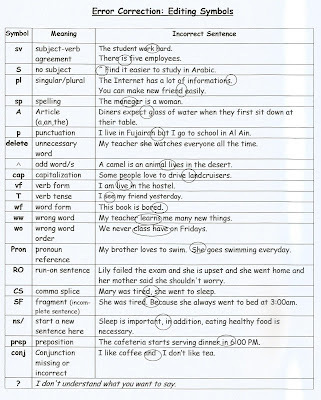 Circulate and monitor as students are writing. Give them guidance and suggestions on how to improve their texts regarding organization, content and topic-related words. Once students have finished writing, advocate peer-editing. Have students work in pairs to check and comment on their colleagues’ work. Let them feel that their work is worth reading and, in this case, another learning experience is set in motion. Next, have students write their final drafts to pin them up on the board or the walls. Ask students to mingle and read all the drafts if time allows and vote for the best composition. Finally, lead an open-class discussion on the best composition eliciting why it is the best. Put students in groups of five or six, preferably sitting in circles. Ask each student to write the first sentence of a story/paragraph and then passes the paper on to the person on the left to write the second sentence. The students continue this way until they finally come up with five/six different stories. Next, they choose the best story to edit and modify before reading it to the whole class. Students can write virtual emails or text messages to each other in class. Ask students to text each other or write emails to decide on what to do on the weekend. You most probably need to review the acronyms and style used in text messaging or features in neutral/informal emails before students start writing. Another way to add a variety to the wiring activities and make them more engaging is to add pictures in the writing process. Put students into small groups and provide them with several pictures. Ask them to choose four or five pictures and construct a story around them. In the end, students read their stories and explain the connection among the pictures in an open-class feedback. Another activity that includes a visual prompt is that students watch a video and write a scene expecting or imagining what will happen next. Students work in pairs or groups to discuss and generate ideas about the next scene before writing about it. Then they read their scenes to the whole class and vote for the best one. The last two activities appeal to most students with different learning styles as they include looking at pictures or watching a video (visual), listening to others (auditory) and discussing their ideas (interpersonal). Varying the interaction patterns and the writing activities turns the writing class into a more productive, enjoyable learning experience. However, preparing students for writing exams needs individual work. So, the closer the exam is the more individual work should be done. Learning a foreign language, especially English, is an unquenchable desire for many people. English is the lingua franca and needed for landing an outstanding job or obtaining a place in good universities. Therefore, many people enroll in English courses in private language schools all over the world. As English teachers, we need to make sure our classes are motivating and interesting, and above all more student-centered to enable our learners to use the language in a more productive way. This post outlines the difference between a student-centered class and teacher-centered class. In a student-centered class, learners have ample opportunities to use the language and to speak more than the teacher does in a teacher-centered class. Learners are usually engaged in pair and group work activities to use the target language communicatively and productively. Activities are conducted in different interaction patterns and students communicate with more than on partner. In such a way of learning, they build good relations with their classmates and learn the language socially and productively. Moreover, the teacher often tries to speak as less as she can. For example, to lead students to a discussion, she shows them a picture or generates a situation and asks one or two students to comment; then she asks them to work in pairs or groups to talk about the picture or the situation before the teacher conducts/facilitates a whole class feedback. On the other hand, in a teacher-centered class, the teacher is the only reference for the students. She lectures and gives long explanations. The most prominent interaction pattern is teacher-students (T-Ss). So if a class has 20 students, each one has less than 3 minutes to talk per hour. In this case, learners would learn the language but they would not be able to practice it in a communicative way. Another reason why a student-centered class is better than a teacher–centered one is the way errors are dealt with. Since the teacher’s aim is to give and facilitate opportunities to students to use the language in class and work out the language rules themselves, errors are looked at as part of learning, not as a downside/drawback of learning. For instance, when students are doing a guided practice free exercise that improves their fluency, the teacher does not give errors much importance. Rather, she monitors the students and writes down a few mistakes that she would shed light on after the task is completed without mentioning the names of those who have made them. The aim here is to teach not to test the students. In a teacher-centered class, on the other hand, the teacher usually corrects every mistake and students try to avoid making mistakes as much as possible. Accuracy is given more importance in a teacher-centered class where many students are reluctant to participate for fear of making mistakes. For this reason, a student-centered class has a relaxing and comfortable atmosphere for learning. Finally, a student-centered class encourages students’ autonomy and independence, unlike the teacher-centered class in which students depend heavily on the teacher. When students work together in different interaction patterns and are allowed to use their dictionaries in some tasks, they become more independent students. Learners try to complete the tasks with little help and guidance from the teacher and that would foster their learning and boost their confidence as language learners. When students work together, they help each other and even weak students can speak to and get help from their groups or partners, and consequently they become more productive. In contrast, learners in a teacher-centered class depend a lot on the teacher and they are afraid or interact with native and non-native speakers outside the classroom. Being independent of the teacher is a privilege in learning another language because acquiring a language happens more incidentally where no one is there for you. In conclusion, in a student-centered class, students learn faster and become more independent learners than in a teacher-centered class as they usually learn the language communicatively. They also have more fun when they interact with each other and form a good friendship which might last for a long time. A student-centered class is what people need to learn a language effectively and appropriately. Supplementary teaching materials have a worthwhile influence on ESL/EFL learners’ motivation and attitudes towards English. Applying various activities in EFL classes make the lessons more fun and motivate the learners, especially those who are getting bored with commercial textbooks. User-friendly and good instructional teaching materials are essential in teaching a foreign language. It is highly recommended that EFL teachers use different materials for teaching the language skills and concepts. Harmer (2007) points out that “Activities and materials which frequently engage learners include: games, music, discussions, stimulating pictures, dramatic stories, amusing anecdotes, etc” (p. 52). Such supplementary materials engage the students’ hearts and minds, raise their motivation and encourage them to use the language freely and communicatively. Crawford (2002) outlines that classroom materials should include audiovisual components because such materials have a lot of linguistic and cultural information. The use of video and multimedia helps English learners understand the English language and culture. Learners also explore the non-verbal concepts such pitch, intonation, and gestures used in the target language. Using newspaper articles or reading texts from encyclopedias compatible with the learners’ level helps them practice and expand the grammar and vocabulary they have learned from textbooks, and build up their vocabulary. English language teachers should apply supplementary ELT materials that involve students in critical thinking and real-life problem-solving activities. These activities open the gate to EFL students to use the language cooperatively and share their ideas with their peers usually in a group work. Such classroom exercises motivate students and encourage the shy and slow ones to participate more without worrying about making mistakes. Opp-Beckman and Klinghammer (2006) state that critical thinking tasks give students the freedom to discuss the topic in the way they like with no restrictions, and most of their answers are accepted. A good example of a critical thinking activity is that when the teacher divides the class into groups; ask students to imagine that they are parents and they want to enroll their young children in a good school. The teacher imposes a few questions such as “What makes a good school?”, and “Are you going to enroll your children in a state or private school? Why?” Then he allocates students 10 minutes to discuss these questions and share their ideas among the group members. Then one student from each group reports to the class the group’s opinions and reasons. In the end, the teacher asks for a vote for the best ideas. In addition to the aforementioned materials, Zoreda & Vivaldo-Lima (2008) argue that enhancing EFL class with literature would offer more exposure to English and it would educate students about the British and American cultures; this can be done by using Graded Readers, which are simplified versions of novels designed for learners of English at different levels. The researcher will explain the importance of extensive reading to his students and raise their awareness about the benefits they will gain form reading every day. To encourage them, he will read the first chapter of a simplified novel at the beginning of the course and then discusses some of the linguistic and cultural aspects from the story. The other chapters will be assigned to students as extensive reading at home, and each week one group of three or four students will report to class a summary of the chapters and what they have learned from those chapters. This task will engage students to work cooperatively together to prepare a short presentation to the class. In conclusion, supplementary teaching materials have a great influence on learners’ motivation and attitude. Motivation in the classroom has the lion’s share of learners’ success. With implementing a variety of supplementary teaching materials, learners will go far in learning a foreign language and they will be more interested. Different materials usually arouse the students’ desire to learn the language, speak it fluently and use it communicatively. Crawford, J. (2002). The role of materials in the language classroom: finding the balance. In J., C. Richards & W., A. Renandy (Eds.). Methodology in language teaching: An anthology of current practice (pp. 80 – 91). New York: Cambridge University Press. Harmer, J. (2007). How to teach English (2nd ed.). Edinburgh: Pearson Education Limited. Opp-Beckman, L., & Klinghammer, S., J. (2006). Shaping the way we teach: Successful practices around the world. Washington: the Office of English Language Programs. Zoreda, M., L. & Vivaldo-Lima, J. (2008). Scaffolding linguistic and intercultural goals in EFL with simplified novels and their film adaptation. English Teaching Forum: 46(3), 22-29. My lessons had been more teacher-centered before. I used to conduct a pretty long detailed presentation of the target language, and focus more on controlled practice activities. Of course, I had my students carry out a lot of communicative activities that aimed at improving their communicative competence, but I used to over-help them and interfere more than necessary while they were working on fluency-based activities. Conducting the CELTA course at ITI Istanbul helped receive a professional training in ELT and get a better idea on current trends in Communicative Language Teaching Approach. The following are four areas I managed to develop in the CELTA course and they became part of my class afterward. Preparing a detailed lesson plan: I learned how to write a formal detailed lesson plan including primary and subsidiary aims, and conventional procedures for receptive and productive skills lessons. I also developed the way I prepare for language areas such as grammar, vocabulary, and pronunciation. A good lesson plan serves as a framework for the whole lesson and focuses teachers on those different stages of a lesson. Now I don't have time for writing a detailed lesson plan and I don't need to do so. As a full-time teacher, I write only the aims of the lesson and the stages that I will carry out during the lesson. However, there are several occasions where I have had to deviate from the lesson plan to cater for the variety of students' needs and demands. Click here to get a sample of a detailed lesson plan. Teacher talking time: My talking time as a teacher was a bit high in my lessons, and too high in the first teaching practice (TP). Although I made good progress in reducing my talking time during the teaching practice, it seemed that I still needed to work on that issue more. In fact, keeping my talking time to a minimum was one of my main action points throughout the teaching practice. Now, I manage to reduce my talking time and make my lessons more student-centered by facilitating more pair, group, round-the-table activities that give students the chance to work together. As a teacher, I should be a facilitator who helps students learn with guidance and directs their learning (Jones, 2007). Varying Interaction patterns: In one of my eight lessons, I had a few students and that made me forget to vary the interaction patterns. There was almost no student-to-student interaction for the first 30 minutes of my lesson. The lesson was teacher-centered and I opted for whole class feedback throughout the lesson and that increased my talking time too. Now I make sure to vary the interaction patterns during my lessons. Students should work in pairs and groups to discuss questions, share ideas, have a debate, check answers, and prepare for a role-play, etc. Sticking to context: In my third teaching practice, the context of the lesson was ‘family’ but I did not stick to it throughout the whole lesson. I used some exercises from other books with a different topic to enable the students to review and practice the formation of yes/no questions in the present simple, but I did not modify these exercises to be related to the context. Now I often stick to the topic of the lesson and adapt the supplementary materials to be related to the context because that would give students the chance to practice the target language using various activities in the same context. Teaching is considered one of the noblest jobs a person can do. Teachers, for the most part, have a great influence on their students’ lives. Therefore, an outstanding teacher should have special characteristics that put them in a class of their own. As far as I am concerned, a good teacher should be qualified, well-prepared, and friendly. First and foremost, any teacher must be academically qualified and knowledgeable about the subject they are teaching. A great deal of that knowledge comes from academic studies. Being a teacher is an enormous responsibility not anyone can bear. For this reason, teachers must obtain proper academic degrees that enable them to land a job in the education field. Obtaining academic degrees in English literature, for example, is not enough to be a qualified teacher. Extraordinary teachers usually receive training courses and/or conduct studies in English langue teaching (ELT). Also, a skilled teacher must be fully well-prepared for every class. No one is ever ready for teaching. Each class is a new experience and challenge. A good teacher is as good as his/her last lesson went. Many students consider their teachers a fountain of all wisdom and expect them to answer their questions. Successful teachers are aware of the importance of adequate and proper preparation for their classes. Using clear examples, miscellaneous tools, and audiovisual materials in the class are the result of a very good preparation. Without prior and enough preparation, teachers will not be able to meet their students’ needs and make their classes more student-centered. Apart from being qualified and well-prepared, an excellent teacher should be genuinely friendly. The first thing they should do at the beginning of the course is to establish a friendly rapport with their students. Teachers and students enjoy having a congenial atmosphere that usually motivates students to be more attentive in their classes and carry out their assignments. Experienced teachers deal with discipline problems professionally and don’t let any problem gets personal. They don’t allow a misbehavior ruin the whole lesson, rather; they talk to those who misbehave in person and show them that they care. Teaching is fun and interesting. It is great to deal with eager minds and see the results of your hard work on your students. I am inclined to believe that a great teacher is someone who has such special qualities as being qualified, well-prepared, and friendly.